The first National Scrapbooking Day was celebrated the first Saturday in May in 1994. Scrapbooking over the course of the last decade has become the nation’s fastest growing hobby. For me scrapbooking is more than a hobby . . . it’s a passion! Scrapbooking is a way for me to let my creative self out and I find it very therapeutic too. 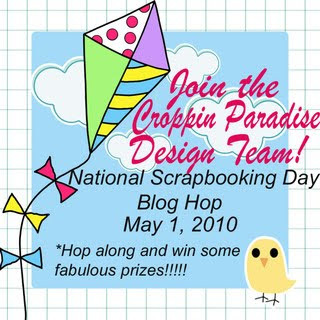 So in honor of NSD Croppin Paradise is hosting a blog hop this Saturday and I hope you’ll join in the fun. Be sure to check out the message boards, visit the design teams blogs and view their new reveals, leave some comments for some awesome prizes and shop for all the latest and greatest supplies in the CP store. love your history tidbit Joan. I like your style! I'll come visit again! Thanks so much!